Originally introduced by Converse over a decade ago, the Rapid Response boot series were a tremendous success with military customers. Now, Reebok has assumed the manufacturing contract and produces the same great design and quality that made these boots so popular. The Reebok Rapid Response Boots were designed with the features of a high-performance combat boot with the comfort of an athletic running shoe. The Reebok RB897 Women's Rapid Response OCP ACU Coyote Brown Military Boot features a lightweight, flexible outsole that won't limit movement when running or jumping. It's comfort features include a well padded upper, tongue, and collar, a shock absorbing EVA midsole. The Rapid Response is completely metal-free so it is airport and X-ray friendly. 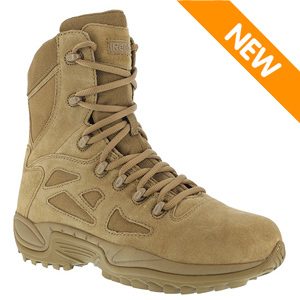 Choose one of the most comfortable military boots on the market today and see why troops love them. This boot is AR-670-1 compliant for wear with the U.S. Army's OCP ACU.